Imagine swapping in a few banners and internal links to your website and building a passive income stream so powerful that you don't have to worry about advertising ever again. Imagine being able to just focus on your website, your visitors, and increasing traffic. And while you do all of that, your money continues to amplify. Imagine having a full team of website monetization experts at your disposal running countless tests for days on end, testing every little detail, just to make sure that you're making as much money as you can. Since it's inception the Secret Gold Guide has paid affiliates over $1,000,000 and that number expands rapidly everyday. Before I begin to tell you about all of the programmers and advertising experts we hired in order to run as many tests and split tests as possible so that we could pay you the most money, I want to start off with a story instead. A long...long....time ago, (well, it's not so long ago because people still do it, but we learned our lesson years ago) people actually believed that you should increase the front end sale price of your product in order to get more money for yourself and the affiliate. Most of these places had very, very, very poor conversion. Obviously, as you increase the price the desire for the product goes down, but does it go down enough so that you make less money in the long run? After running testing of front sale prices ranging from virtually free to $150 for our package, we settled on $17. Now, $17 obviously isn't too appealing as an affiliate because you're only getting about $9 for the original sale, but bear with me here I'm not done. We found that $17 was the optimal price to maximize the amount of money made per hop. It means that, although you only get $9 per sale, the conversion is so much better that you actually sell a lot more copies which in the end, results in more money. We found that the conversion rate of our product at $47 was about 1 in 400 if we we're lucky on average. This means for every 400 customers, we would sell $47 worth to a customer. By lowering our price to $17 we found that the conversion improved significantly, to about 1 in 100. So for every 400 customers we would sell 4 copies of our guide which resulted in $68 total. That's a whopping increase of over 44% in revenue that you get as an affiliate!! Sounds pretty good right? It is, imagine if you got a 44% pay increase on your current salary just by simply changing the price of your product (it takes a second to change the price) and BAMN, you just got a 44% raise. You're probably thinking hey that's really awesome, good thinking! Right on! I'm with you, but there's a secondary motive to why we changed the price to $17. The second part of the process of making money as an affiliate was what is called an upsale process. Most people at this stage love to sell other peoples products, which we found to not be beneficial at all. When you upsale someone elses products instead of your own, you lose control over everything about that product, from conversion rates on out, because on our own products, we control the sales page and everything about the product. We also found that some of the products we sold were not up to quality standards that we would have liked to have seen so we had to stop selling them because people were associating bad products with our guide, giving us a bad reputation, which no one wants. This is very important because of what I'm about to tell you next, and this is the most exciting part of how you get paid and it's the key to making a ton of money every month. One day we got the great idea while trying to figure out what to upsale (because we didn't have any other products at the time) that we should stop selling other peoples products and just sell our own in the upsale process. We had our team of experts do a lot of research and analysis on what we could produce that would get our affiliates the most money. They decided making a VIP member area would be our best bet. That is, access to a website that requires a monthly subscription. Inside of this VIP area members were given access to all of our guides, bonus guides, and weekly gold tips. We began selling this package for about $9 as an upsale (this was when we were charging 27-37 up front for our guide), where we converted about 33% of the subscribers. This was great for our affiliates because they made about $5 every month from every customer, and some customers stuck around for years. This turned into an extra $60 a year for our affiliates. How can we increase our subscription rate? Then it ocurred to us. "Why don't we just get rid of the upsale and sell the main product as a subscription"
And that's exactly what we did. The price that made the most money with our product as a subscription....you guess it, $17 a month. We thought a lot of people might cancel in the first month but the opposite happened. We are retaining over 75% of our subscribers each month. We went from a 33% conversion into our VIP member area to a 75% conversion, that's a massive increase. The best of all though. Every customer you send us, you continued to get paid the same amount each month as the initial sale. The side effect is...PASSIVE INCOME!! Not just a little bit of passive income, a lot. By the end of the month you've sold about 450 guides, resulting in about $4000 your first month. Remmeber when I said we have a retention rate of 75%? Well, the next month you also make $4000 a month in sales, but you retain 75% of that $4000 in reoccuring fees from subscribers, resulting in a whopping $7000. Several of our affiliates already have over 1000+ subscribers themselves, do the math, that's over $9000 a month from just subscribers. Unlike a lot of other gold products or World of Warcraft products in general that are considered "sketchy" or a "scam" the Secret Gold Guide is the most transparent product on the market. The Secret Gold Guide has been around for over four years and is completely rewritten for each expansion where other products don't take the time. I have a facebook with over 1200 likes and I interact with customers through email frequently providing my own personal help to them. On a poll conducted by AlmostGaming.com, my gold guide was voted the favorite by a land slide. The Secret Gold Guide is sold by other reputable sites such as wow-professions.com, almostgaming.com and maxdps.com to name a few with hundreds of other affiliates as well. You'll also be pleasantly surprised to hear that we have one of the lowest refund rates around at only 2%. I watched a video of another clickbank product that was bragging about his 14% refund rate. That means that 98% of the money you make will stay with you, unlike other vendors where you sell $10,000 of products and you lose a large chunk of that to refunds. We work closely with several large affiliate sites and own some of our own. Periodically we are able to run tests by actually selling the competition's products. I cringed at the idea of doing this at first, but we had to find out how we stood up. Over the years, we've never found anyone that can come close to our "Earnings per Hop". Years ago when we first tested against other competitors we blew them away! Affiliates can expect 10 to 20 cents per hop they send our way depending on the quality of that traffic. Most other vendors payout between 5 and 8 cents per hop. Today, not only do we still crush the competition on "Earnings per Hop", but we blow everyone away when we add in the amount rebills bring in. Add to that our super low refund rate and high level of customer satisfaction and you'd have to be drugged to sell another product. Start Making Your Money Today! There's really no reason not to have the Secret Gold Guide for sale on your wow related site. It works perfectly with adsense or by itself. Most people think adsense out performs the Secret Gold Guide, and it can in certain placement areas, but what they don't realize is that Adsense is not a competitor of the Secret Gold Guide, they go hand in hand. The Secret Gold Guide is best sold from internal links, some place adsense cannot go and it serves well as an alternative to having 3 adsense banners up on your page where the chances of you showing the same ad in all three is very likely. This screen shot above is a real screen shot off a very very popular world of warcraft site, I had to black out most of it because it would be too embarassing if they found out who they were. As you can see all three staples ads are the same. By simply swapping in one of our banners the same size this website owner could make thousands more a month. The worst part about adsense that people do not understand is that Adsense has switched to a new targetting system. This means by reading your search history it determines the ads it will show each customer. Sounds like a great idea right? 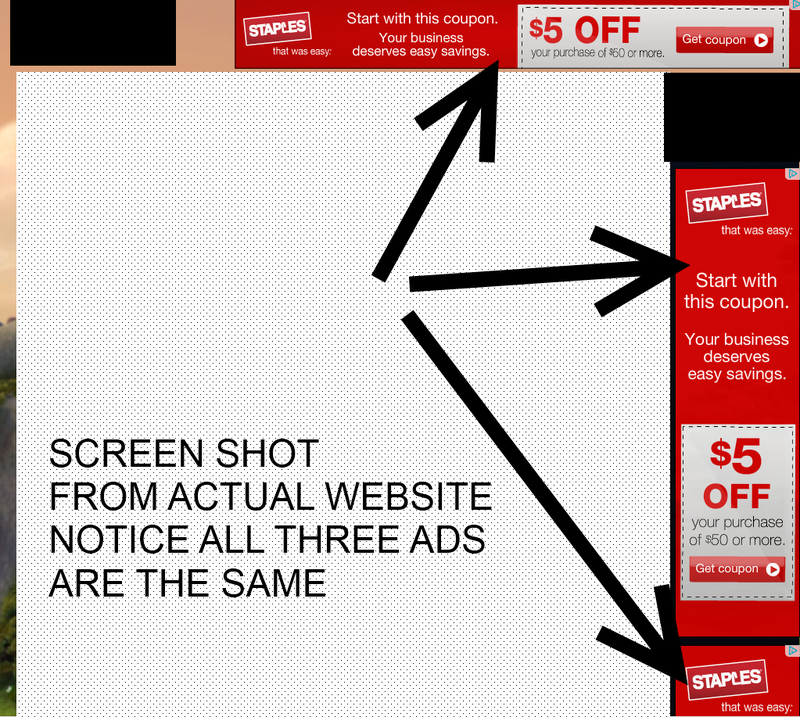 At first glance it does, but think about it...that means you're going to see the same ads over and over and over again. Let's be realistic, even if you decide to buy a car by clicking an adsense ad you're not going to click the same one every site you go to, this makes adsense almost useless for regular internet users. No one wants to see a non-related ad, that doesn't make sense, why would you be looking to buy a car when you're trying to read about World of Warcraft? I bought a generator two weeks ago but I'm still seeing Gennerac ads on all wow related websites! Otherwise, I see Staples and Chrysler ads, give me a break. Great! It's really easy to start, click the button below to head to our resources section where we have banners and other information to get you linked into your automatic money making machine today! Transform your site, transform your lifestyle! Start today! This is not a copy of Blizzard's official World of Warcraft strategy guide.